Until very recently, Microsoft wasn't known for making hardware. Sure, it put out the occasional Zune, but most of the tech running Redmond's desktop and mobile operating systems traditionally comes from its partners -- the Surface being the exception, of course. According to the Wall Street Journal, Microsoft might consider making that exception a rule: some of the firm's part suppliers say that the company is experimenting with a smartphone design of its very own. Folks familiar with the matter say the device in question is between four and five inches, putting it in a sweet-spot that's larger than the iPhone 5, but not quite as daunting as a Samsung Galaxy Note II. Don't get too excited, however, sources aren't sure the if the device will go into mass production, and Microsoft is expectantly tight-lipped about the rumor. Still, we wouldn't scoff at a smartphone with a build quality to match the Surface -- though it might rub some of Redmond's hardware partners the wrong way. WSJ: Microsoft testing homegrown handset designs with suppliers, may not see mass production originally appeared on Engadget on Fri, 02 Nov 2012 01:02:00 EDT. Please see our terms for use of feeds. Most video walls would be just a tad too large for the average living room, but the Tokyo University of Technology might have a clever technique to make them travel-sized. Its new Pinch interface joins mobile devices (currently iOS hardware) into a single display simply by making the namesake gesture between at least two gadgets: WiFi keeps them in sync and recognizes the relative size and orientation. While we probably wouldn't resort to a wall of iPads in place of a large TV, there's clear practical uses like extra-large creative apps, communication and very local multiplayer games. The best news may be that the university isn't keeping the technology to itself. It wants developers to borrow Pinch for their own apps, which could lead to a legion of smartphones and tablets getting extra-cozy. Tokyo University of Technology's Pinch interface creates ad hoc video walls from mobile devices (video) originally appeared on Engadget on Fri, 02 Nov 2012 04:27:00 EDT. Please see our terms for use of feeds. When we got a look at the new Nexus 10 running Android 4.2 Jelly Bean, we expected Google's Music Explorer feature would slot into the Play store alongside the OS update. As it turns out, the feature has been quietly implemented, so you can now check out similar artists from within another's catalogue. We had a fiddle with it, but weren't particularly impressed -- you can only see three similar artists in the bubble-like UI at any one time, with no explanation of why they are linked together, or how the recommendations are decided. Some people will probably appreciate the casual browsing experience, but we found it a little too uninformative. Of course, you can make up your own mind by grabbing your tab and heading for the Play store. Just don't be surprised if the whole experience ends up bursting your bubble. Google's Music Explorer hits the Play store, recommends artists based on... originally appeared on Engadget on Fri, 02 Nov 2012 07:43:00 EDT. Please see our terms for use of feeds. Mac fans not keen on picking up a new iMac to get that best-of-all-worlds Fusion Drive might not have to consider a full-on system swap if they're brave enough. 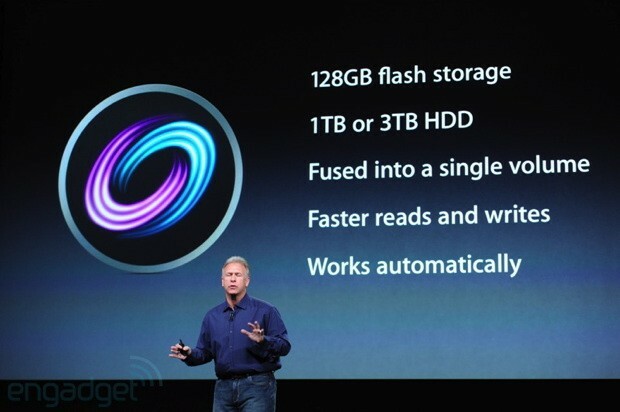 Knowing how Apple's approach unites an SSD and a spinning hard drive in a single logical volume, developer Patrick Stein has used command line code to do just that inside his Mac Pro and prove that it works. His series of experiments with organized data shows the effect on storage speeds and that the pseudo-Fusion should even work with less common ZFS formatting. The publicly available instructions could well be tempting to Mac fans who want speed and storage all at once, although we might personally take a pass -- there's more than a fair share of risk in using an unofficial hack to recreate a storage technique that Apple hasn't even shipped. Mac Pro owner crafts an example Fusion Drive, shows the fearless how it's done originally appeared on Engadget on Thu, 01 Nov 2012 05:48:00 EDT. Please see our terms for use of feeds. 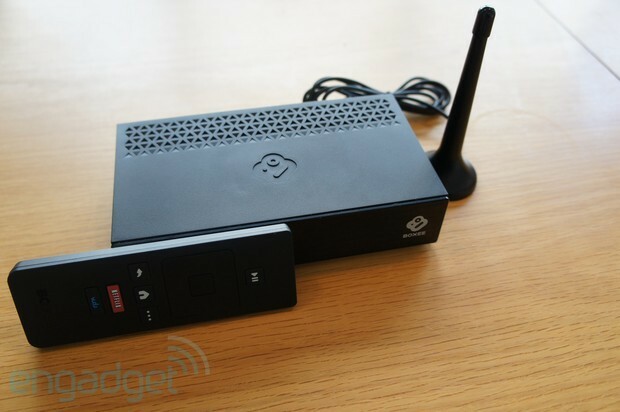 Launch day has finally arrived for Boxee's second hardware effort and now we're finding out even more about it. As we heard yesterday, the $99 Boxee TV will be a Walmart exclusive at retail (also available via Boxee's website), however early adopters in the holiday season can also expect a three month period to try out the "No Limits DVR" for free, plus a discounted service rate of $9.99 (normally $15) for life, three months of free Netflix access and a $5.99 Vudu credit. After the holidays, buyers can still expect free DVR trials, but there's no details on exactly what is in store. The list of supported apps has also grown, with Spotify, MLB, TED, Wall Street Journal, Accuweather and Boxee's own Cloudee joining the previously announced Netflix, Vudu, YouTube, Pandora and Vimeo on day one. Finally, we've got our first look at the HTML5 webapp that serves as a guide and second screen remote control. For owners of the original Boxee Box, the company posted in a blog entry (the link appears to be down at the moment) that all back end support will remain running "for the foreseeable future" and an updated Flash Player is on the way. The bad news is that due to a lack of updates from Intel, it will not be able to upgrade the Netflix app for access outside the US and Canada, and agreements with premium content providers prevent opening it up for root access. The project has evolved a long way, from XBMC spinoff with a focus on! support for locally stored and streaming video, then moving to a set-top box, offering OTA live TV viewing, and now its latest incarnation as a more conventionally shaped box built for OTA and ClearQAM channel viewing with the possibility of easier cable access in the future. We'll be reviewing the new hardware soon, potential buyers (especially in New York City, Los Angeles, Chicago, Dallas, Houston, Atlanta, Philadelphia and Washington DC where they can access the Cloud DVR) can check out the galleries for one last look or hit the link below to try out Boxee's take on the future of TV viewing. Boxee TV hits Walmart aisles today, flashes more apps, guide webapp and 3 months free DVR service originally appeared on Engadget on Thu, 01 Nov 2012 10:00:00 EDT. Please see our terms for use of feeds. The latest update for Google's efforts to index of IRL mapping information is focused on your computer. Google Earth 7 for your desktop is finally ready to match the Android and iOS versions, with support for its 3D renderings in 25 cities, and "tour guide" feature that drags you through 11,000 locations around the world, no passport or Frommer's required. This update for PCs comes alongside the addition of 3D imagery for Avignon, France; Austin, Texas; Munich, Germany; Phoenix, Arizona; and Mannheim, Germany, which all apply to both the desktop and mobile editions. Hit the source link for more information or head to the Google Earth website to check it out yourself, who knows, you might find a pyramid. 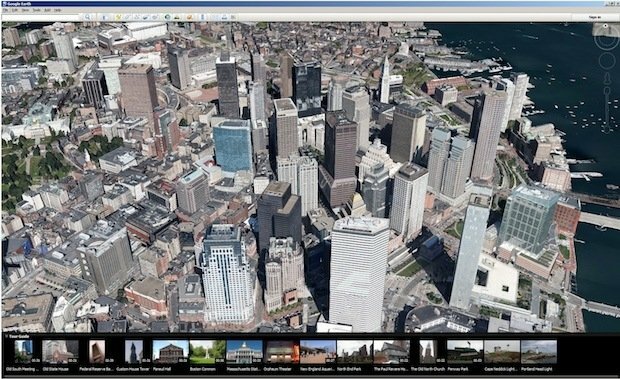 Google Earth 7 update brings 3D imagery, tour guide features to your PC originally appeared on Engadget on Thu, 01 Nov 2012 10:40:00 EDT. Please see our terms for use of feeds. Over the summer, word surfaced at TalkAndroid of Sprint carrying the ZTE Flash, a surprisingly potent mid-tier smartphone that would bring a 12-megapixel camera into a category all too used to mediocre photography. Its then-rumored October launch has come and gone, but we may just have firmed-up details thanks to an anonymous tipster. 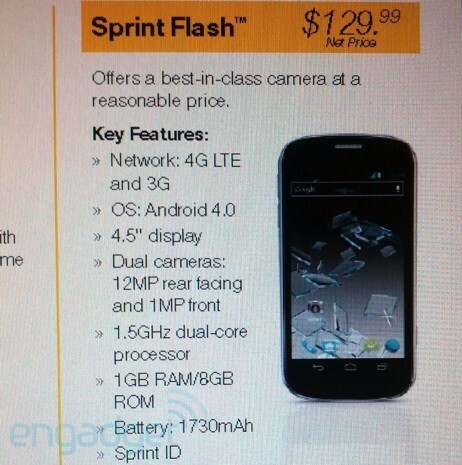 According to some purported internal documentation at the carrier, the smartphone could show up on November 11th simply billed as the Sprint Flash -- we imagine the network doesn't want to broadcast a controversial name -- and carry a reasonable $130 contract price after a rebate. For the money, it might be hard to top. While we're not expecting wonders with that 8GB of storage, so-so 1,730mAh battery and slightly creaky Android 4.0, the 4.5-inch screen, dual-core 1.5GHz chip (likely a Snapdragon S4) and LTE could provide some savings to those who don't need a device quite as large as the Galaxy S III. Don't worry if you're not budgeting for ZTE's latest, either. If the full price list available past the break is accurate, November 11th could be a busier day than expected -- the Flash and LG Optimus G could be joined by an LG Mach costing $100 after a rebate. This and a new titanium-co! lored Ga laxy S II for the budget crowd could have Sprint's roster completely freshened just in time for the busiest sales of the year. ZTE Flash may bring its 12MP camera to Sprint on November 11th with LG Mach following suit originally appeared on Engadget on Thu, 01 Nov 2012 11:45:00 EDT. Please see our terms for use of feeds. 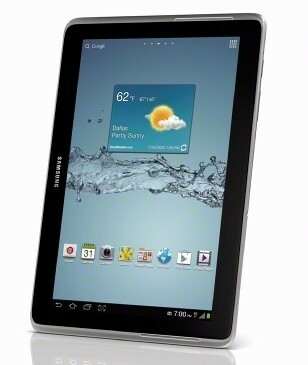 Verizon rolled out an LTE-equipped version of its smaller counterpart a few months ago, and now Sprint has announced that it'll begin offering the Samsung Galaxy Tab 2 10.1 with 4G LTE on November 11th. That will be available for $550 (sans contract), and you'll be able to activate it on one of the carrier's new month-to-month tablet rate plans, which run from $15 a month for 300MB of data to $80 for 12GB -- Sprint says it's also waiving activation fees on all 3G/4G tablets "for a limited time." As for the tablet itself, it comes with a speedier 1.5GHz dual-core processor than the WiFi-only model (which clocked in at 1GHz), but looks to otherwise be the same 10.1-inch device, right down to the now somewhat dated Android 4.0 for an OS -- no word on a planned upgrade to 4.1 or 4.2 just yet. 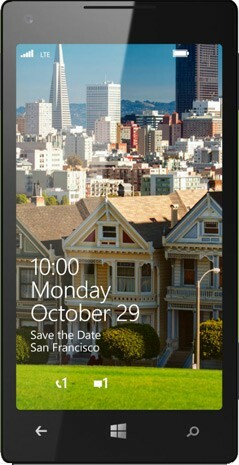 Samsung Galaxy Tab 2 10.1 with 4G LTE hits Sprint on November 11th for $550 originally appeared on Engadget on Thu, 01 Nov 20! 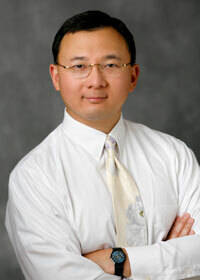 12 12:25 :00 EDT. Please see our terms for use of feeds. That was quick -- not long after launch details of the LG Mach were caught lurking in Sprint's catalog, the carrier has confirmed them. Fans of the Korean firm's aesthetic who also like their QWERTY keyboards can buy the mid-range smartphone for $100 on November 11th, the same day its bigger Optimus G cousin reaches stores. Just be sure to avoid the Sprint website during the wait for the newly dated device; Optimus G pre-orders have started at the source link, and a click on LG's flagship could be mighty tempting. 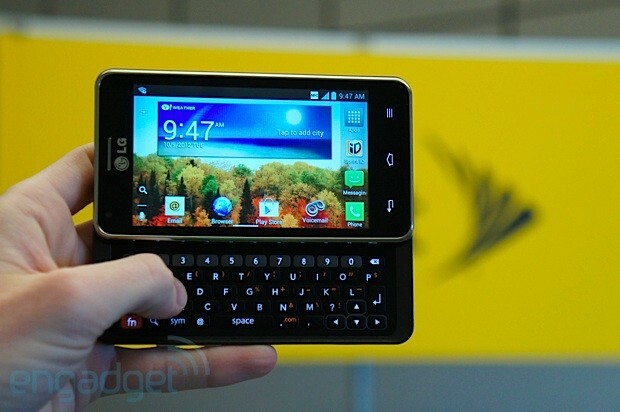 LG Mach reaches Sprint on November 11th at $100, Optimus G pre-orders begin today originally appeared on Engadget on Thu, 01 Nov 2012 13:43:00 EDT. Please see our terms for use of feeds. Looks like releasing its first in-house-built mobile game for Android (and other platforms) wasn't quite enough for the online retail giant. Amazon announced earlier that its Cloud Drive Photos application is now available on Android for both handset and tablets, giving users of Google's OS a cloud-based hub to use for uploading, saving, sharing and viewing pictures -- of course this also includes the retailer's kind handout of 5G of free storage, though folks could easily upgrade to 20GB for a $10 per-year fee. The Cloud Drive Photos app is up for download now, so hit that Google Play link below if you're looking for yet another place to keep all those awesome shots you snap with your device. Amazon brings Cloud Drive Photos app to Android, keeps your shots safe originally appeared on Engadget on Thu, 01 Nov 2012 15:19:00 EDT. Please see our terms for use of feeds. It's no secret that Hurricane Sandy has worked a number on communications infrastructure, but now a time-lapse video created by Renesys gives us a clearer picture of when and where internet outages occurred as the storm made landfall. Green squares on the map above indicate that 99.95 percent of networks in the area are reachable, while red squares denote that more than five percent of networks are down. In Manhattan's case, Renesys estimates that there was only a ten percent failure, which it considers impressive since power was cut to much of the island. Ten percent may not sound like a huge outage, but the firm points out that population density makes it equivalent to taking a country the size of Austria off the grid. As for the 90 percent of networks in the borough that stayed online, they survived thanks to generator power. If you'd like to witness the playback of outages between October 29th and 30th, head past the jump for the video. Time-lapse map shows internet outages as Hurricane Sandy makes landfall (video) originally appeared on Engadget on Thu, 01 Nov 2012 16:17:00 EDT. Please see our terms for use of feeds. 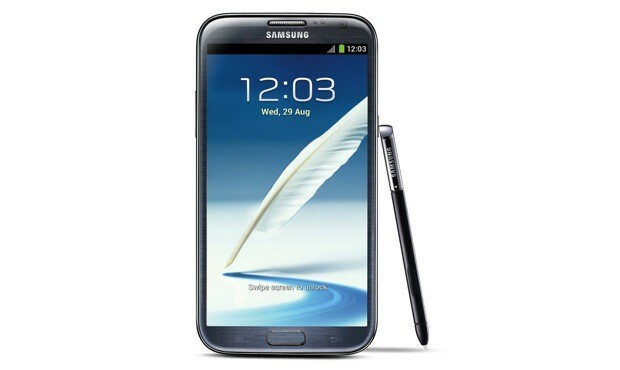 Samsung: Galaxy Note II has sold 3 million units worldwide originally appeared on Engadget on Thu, 01 Nov 2012 21:50:00 EDT. Please see our terms for use of feeds. US Cellular announced on Wednesday that it will increase its LTE network coverage by 30 new markets on November 5th. The first territories to be be summarily blessed are: Iowa, Wisconsin, North Carolina, Oklahoma, Illinois, Maryland, Missouri, New Hampshire, Vermont, Virginia and West Virginia. While this is great news for customers who call these states home, the carrier has yet to detail which cities will be making the jump to 4G. In the meantime, we'd advise keeping an eye on US Cellular's coverage map to see if your stomping grounds made the cut. For an encore, the carrier will light up Rockford, Illinois; Medford, Oregon; Yakima, Washington; and Knoxville, Tennessee at an undisclosed time. 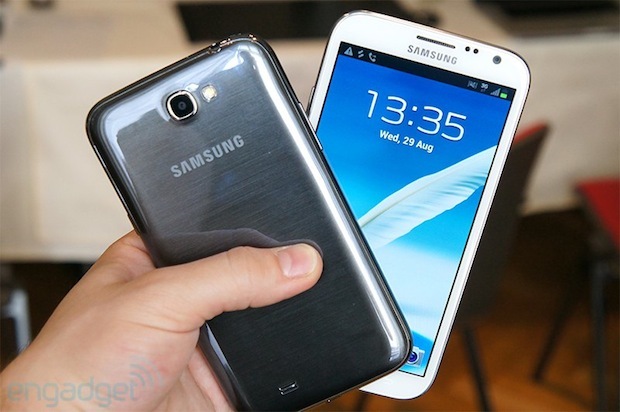 As for its LTE-ready smartphone roster, your current options are a trio of Samsung-made Android devices: Galaxy S III, Galaxy Note II and the Galaxy Metrix. Hopefully, as America's eighth largest wireless carrier's LTE footprint increases, so will its stable of suitable handsets. Until then, US Cellular 4G hopefuls, we hope you like the taste of TouchWiz. US Cellular bringing LTE to 30 additional markets on November 5th originally appeared on Engadget on Wed, 31 Oct 2012 21:34:00 EDT. Please see our terms for use of feeds. Stitcher is already a heavy hitter in the world of mobile apps, but users will now find their favorite radio shows and podcasts are accessible from the desktop. Today, the company announced an HTML5 version of its popular app that's optimized for all of the major browsers. Upon login, Stitcher users will discover their existing favorites for on-demand listening, playback controls at the bottom of the screen, along with Stitcher's discovery and sharing tools. While still in beta, the service is integrated between the desktop and mobile platforms, which lets users resume listening from wherever they left off, regardless of the device or platform. If you want to see more of what's in store, feel free to check the gallery below, or simply follow the source link to start listening for yourself. 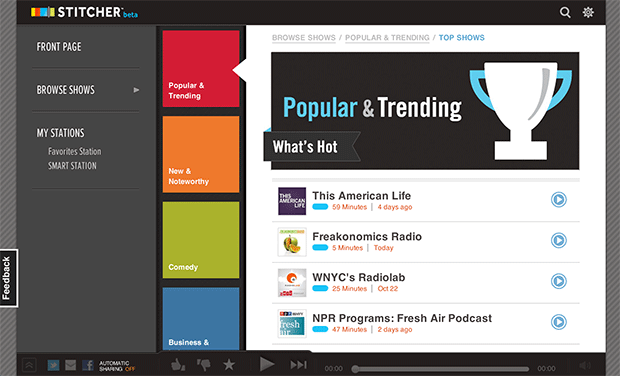 Stitcher keeps the news flowing for desktop users with new web-based app originally appeared on Engadget on Wed, 31 Oct 2012 22:34:00 EDT. Please see our terms for use of feeds. T-Mobile has already made an odd pair of decisions around its approach to the Nexus 4, namely its choices to ask $200 on contract and $500 up-front for a smartphone that costs $349 unlocked. It might be time to add a third quirk to the list, if a forgivable (and not entirely surprising) one. The carrier has confirmed to TmoNews that it won't be offering WiFi calling through its edition of Google's flagship; if cost or coverage makes cellular voice a scarce resource, VoIP might be the only viable backup. We weren't assuming that T-Mobile would suddenly layer the Nexus 4 in custom features when the very point is to run an unspoiled Android 4.2, but the strategy leaves us even less of an incentive to submit to long-term commitments when a virtually identical, unfettered Google Play model beckons. November 13th is looking better every day. 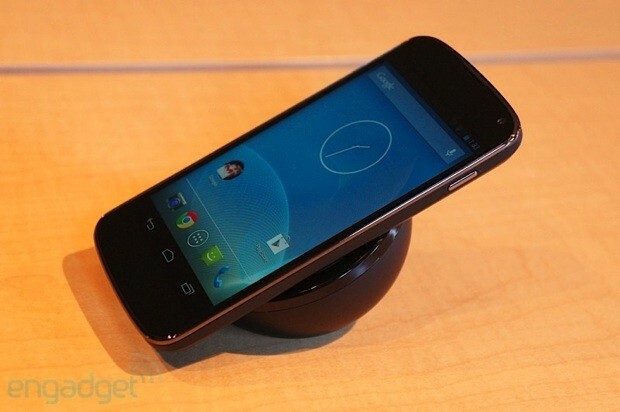 T-Mobile says its Nexus 4 won't provide WiFi calling, makes a stronger case for going unlocked originally appeared on Engadget on Wed, 31 Oct 2012 23:30:00 EDT. Please see our terms for use of feeds.